How can you reduce the size of a machine vision camera to make it fit into a tyre for a 360° inspection? And how is the 360° inspection performed? See it all in this video. Carl Zeiss Optotechnik GmbH, headquartered in the Upper Bavaria region of Neubeuern, generates about one third of their annual sales with systems for the non-destructive inspection of tyres. The company, which has been known as Steinbichler Optotechnik GmbH until 2015, is one of the world’s leading suppliers in this segment and has already implemented inspection systems for tyres with diameters of up to 4300 mm. Such enormous tyres are used in huge mining vehicles, but also new and retreaded pneumatic tyres of passenger cars, trucks, aircraft, motorcycles. Even the racing tyres of all current Formula One teams are tested for defects by the Carl Zeiss Optotechnik inspection systems. The company’s tyre inspection systems are named „Intact“ and are based on the shearography optical measurement technology which has established itself as the standard in the automotive sector, in aviation it is even required by law. Shearography is an interferometric testing method that is able to detect even the smallest damage or defects with a size of only a few microns on stressed components. The test object is illuminated with a laser light and is inspected by a CCD camera with a so called shearing lens. These lenses project the object image onto the camera chip twice; each object point is thus represented twice which results in an interferogram. When the test object deforms under load, the laser light, reflected by the component, changes. Due to superposition of an image in its unloaded state, the recording under load means the changes of each point in the image can be detected. When testing tyres the required load is generated by varying the ambient pressure. Between the first and the second recording the pressure is lowered by about 50 mbar. Any air bubbles enclosed in the tyre expand as a result of the negative pressure and slightly deform the surface of the tyre at the weak points. Conclusions on defect type and size can be drawn by comparing and evaluating the resultant images. „We have been working with shearography technologies since around 1990“, explains Rainer Huber, NDT product manager at Carl Zeiss Optotechnik who is responsible for the development of the tyre testing systems. His company holds several relevant patents, such as one for the spatial phase shift, the direct phase measurement with only one shearing image. In addition to tyre testing, shearography is used for non-destructive testing of composites. Rainer Huber, NTD Product Manager at Carl Zeiss Optotechnik, in front of an Intact system with tyre flipper. Carl Zeiss Optotechnik´s Intact systems are used worldwide by all well-known tyre manufacturers as well as by a large number of medium-sized retreading companies. A total of more than 1,000 systems have already been installed, including licensed systems with Zeiss measuring heads. „Our goal is one hundred percent safety – the failure of a tyre in operation or when being inflated can have fatal consequences“, says Mr Huber. In the testing process the tyre tread and the side walls are examined for internal detachments and air inclusions, which would not be visible with the naked eye. „When testing retreaded truck tyres we know from experience that about 20 percent of the visually impeccable used tyres are classified unsafe when applying shearography“, Mr Huber points out. The use of shearography is also cost-effective, especially in the area of retreading. The customers benefit from cost savings in production and purchasing, since damaged or improper carcasses don’t even make it into the marketplace in the first place, thus avoiding unnecessary processing cost. The Intact systems are characterised by their non-contact and non-destructive application. Since there is no need for preparation of the tyre surface the application is simple, fast and cost-effective: After loading the pressure-tight test chamber the measuring heads are precisely placed inside the tyre to record the tread from the inside thanks to the automated detection of the tyre size. Each of the four measuring heads inspects a sector of 90 degrees. For inspecting the treads the measuring heads are automatically lowered into the tyre. Machine vision is the technical base of the tyre testing systems: Each measuring device consists of four measuring heads, each containing a camera with a corresponding lens. Since the 90s, the company – at that time still operating under the name Steinbichler Optotechnik GmbH – has been dealing with machine vision and has developed extensive know-how in this field. 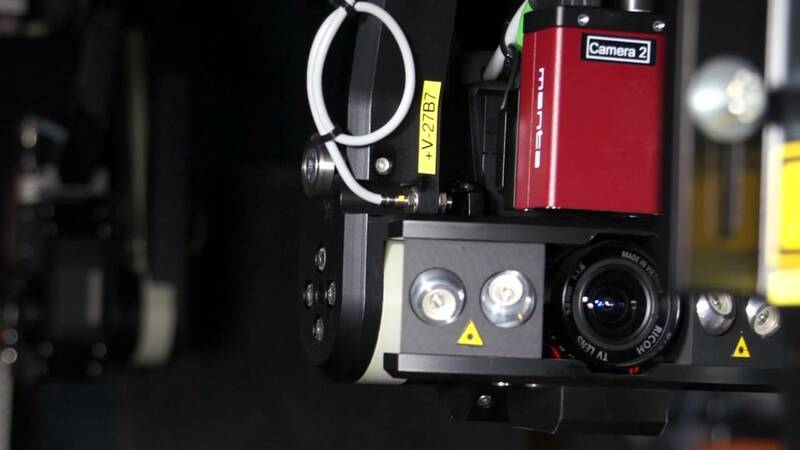 And for almost that long, they have been successfully working with STEMMER IMAGING, who supplies the Carl Zeiss Optotechnik GmbH with cameras and other optical and electromechanical components. „Our clients expect reliable machines in order to be successful in their markets. And that is exactly what the Carl Zeiss Optotechnik is able to guarantee on the basis of many years of experience in this field.“, explains Mr Huber. „It is very important for us that every component used is supplied by a reliable partner with the appropriate know-how and the right range of product and services. For this reason, we have been cooperating with STEMMER IMAGING on all aspects of machine vision for many years." A greatest challenge was reducing the size of the measuring devices in a way, that they would allow the testing of even smaller tyre diameters. So far, the limit has been 16-inch-tyres due to the footprint of the measuring heads. Now the goal was, to be able to inspect even 12-inch-tyres. However, the concept of having up to four measuring heads per device will remain the same; the simple formula was: the more measuring heads, the shorter the measuring time, the higher the throughput. However, the necessary scaling down of the measurement device could not be achieved geometrically with the Allied Vision standard cameras that had been used so far. A substantial redesign was necessary, at the same time continuity was required: Carl Zeiss Optotechnik had been using the monochrome Allied Vision Prosilica GC1380 cameras for years. These cameras are equipped with a Sony ICX285 CCD sensor providing a resolution of 1388 x 1038 pixels. This sensor is especially designed for infrared applications and is ideally suited for this application when being combined with the optics that Zeiss had developed for shearography measurement. For the redesign Carl Zeiss Optotechnik opted for a high-speed version of the previously used Prosilica camera with the same CCD sensor: The Allied Vision Manta G145B-30fps with a frame rate of up to 30 frames per second is now being used. Due to the discontinuation of the built-in Sony CCD sensor by the year 2020, Huber does not expect any major problems: "Since Allied Vision also offers a mechanically identical CMOS camera, easy exchangeability of the cameras is guaranteed." More headaches were caused however by a mechanical problem: the standard version of the selected Manta cameras included cabling that was too long to inspect the 12-inch tyres with four measuring heads contained in one measurement device. „This problem could be successfully solved through a special modification by STEMMER IMAGING’s hardware development department“, praises Mr Huber: „In close cooperation with our mechanical design department, the STEMMER IMAGING experts developed a housing variant in which the cable connections are arranged at an angle of 90 degrees to the image layer and not linear as in the case of the standard housing." That way, the length of each Manta camera could be reduced from 80 to 64 mm – and at the same time, the geometrical guidelines for the inspection of tyres with a 12-inch diameter could be observed. Since then, all cameras for use in the Intact systems have been modified by STEMMER IMAGING before delivery to Carl Zeiss Optotechnik. However, the customer-specific service was not yet finished: the optics used also required an adjustment due to the vibrations in the systems. Standard optics couldn’t cope with the high strains for a long time and led to changes in the presetting of the aperture and thus to variations in the measurement results. Thanks to an aperture presetting and the sealing of all screws on every individual lens, STEMMER IMAGING was able to reliably solve this problem as well. Another engineering service was the selection and the long-term testing of CAT5e Ethernet cables for robotic use with an angled connector. These cables had to pass a long-term stress test attached to an Intact measuring head before being installed in the system. The test was conducted and logged by STEMMER IMAGING’s in-house cable design and build service. This ensured that the cables were able to durably withstand the loads in the machine with no transmission problems. For serial production, each cable is now being tested before delivery and sent with a corresponding test protocol. Another key component of the complete system is the software - an essential part of Carl Zeiss Optotechnik’s know-how. Traceability and a simple classification of the test results are the most important features. In addition to the simple user guidance for the execution and storage of recordings, the software also provides an automatic identification of possible defects by means of significant deviations in the stored shearograms. The defects detected by the system must then be evaluated by the operator on the basis of the resultant images, which requires a certain level of experience. Comprehensive training courses in the shearography tyre test as well as competent service and support round off the range offered by Carl Zeiss Optotechnik. Thanks to the active support and the smooth cooperation, only a few months passed from the initial inquiry to the commissioning of the first prototype. According to STEMMER IMAGING marketing manager Peter Stiefenhöfer, this service is a typical example of the company’s added value: "Our strategic positioning is often not yet recognised properly: We have long been more than just a sales house. We consider ourselves as a manufacturer for certain components and as a service provider, tremendously supporting our customers, in this case the Carl Zeiss Optotechnik, in the realisation of their tasks." More than 25 years of experience and competence in optical measurement and sensor technology have written the success story of Carl Zeiss Optotechnik GmbH. Since its founding in 1987, the company has been developing and marketing high-precision optical measurement systems and corresponding software solutions, which are used in a wide range of applications of numerous well-known industrial companies and research facilities. Very compact camera with CCD or CMOS sensor from 1/4" to 2/3"
Our clients expect reliable machines in order to be successful in their markets. And that is exactly what the Carl Zeiss Optotechnik is able to guarantee on the basis of many years of experience in this field. It is very important for us that every component used is supplied by a reliable partner with the appropriate know-how and the right range of product and services. For this reason, we have been cooperating with STEMMER IMAGING on all aspects of machine vision for many years.